If you have a Symbian S60 mobile phone (Nokia N-Series phones like N73, N95, N80, N91, N80 and E-Series phones use Symbian S60v3 as OS) you must have encountered the very common certificate errors like 'Certificate Expired' or 'Certificate Error. 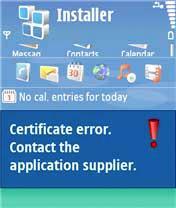 Contact Application Supplier' while installing software or themes or on your mobile. 1- Open your mobile Main Menu. 3- Now change the year back to 2010 or 2009. 4- Now install the application. 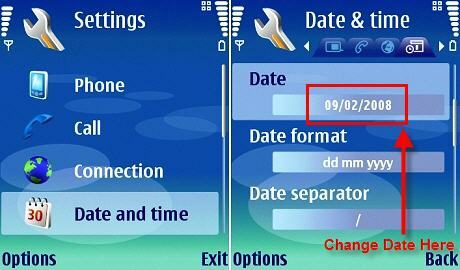 5- Don't forget to change date back to original. If the above does not solve the problem goto Application Manager > Options > Settings and set "Online Certificate check" = Off and Software Installation = All. "Installation security error. Unable to install"
To solve this error and install application/Theme navigate to Tools -> Options -> Setting -> Software Installation and change setting to On.